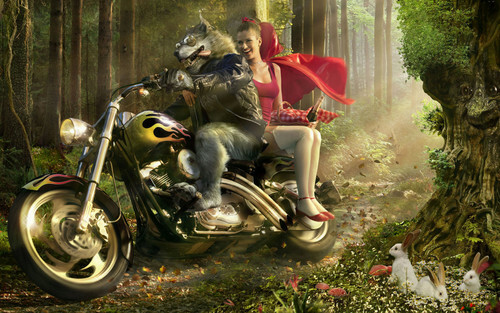 Little Red Riding हुड, डाकू Parody. . HD Wallpaper and background images in the Fairy Tales & Fables club tagged: little red riding hood 1280x800 wallpaper funny fairy tale. This Fairy Tales & Fables wallpaper might contain मोटरसाइकिल पुलिस, मोटरसाइकिल पुलिसकर्मी, गति सिपाही, मोटर साइकिल पुलिस, गति पुलिस, पुलिस मोटर साइकिल, मोटरसाइकिल, मोटरसाइकिलिंग, motorcycling, निशान लें, गंदगी बाइक, scrambler, निशान बाइक, and ट्रेल बाइक.